The best air purifiers can do wonders to relieve those of you who suffer from allergies or asthma. They can remove pollen, dust, pet dander, smoke, mold spores, and other allergens from the air – giving you fresh, clean air to breath. The best air cleaners contain HEPA filters that capture 99.7% of pollutants as small as 0.3 microns. You should also know how much replacement filters cost, because they can be expensive and you will have to replace them unless you buy one that can be cleaned. One item to consider when shopping for an air purifier is the clean air delivery rate (CADR) which measures how fast a filter can clean smoke, pollen, and dust and thus determining the suggested size in square feet of the room to be cleaned. A CADR rate over 350 is considered excellent, while anything under 100 is quite poor. Other things to consider include the noise level, number of fan speeds, automatic mode, dust monitor or air quality sensor, and length of warranty. The more you suffer from breathing problems like allergies or asthma, the more you should invest in your purifier or air filtration machine. The top models sell for around $1000, while there are many cheaper options as well, especially ones designed for a smaller room. We looked at and graded dozens of models to come up with our list of the top 10 best air purifiers which we review below. The IQAir HealthPro Plus is our choice for the best air purifier. It is a bit expensive at around $900, but its performance is second to none and for people with allergies it is worth every penny. 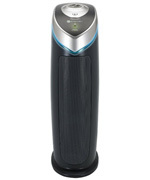 This IQAir model also won numerous awards and 5-star reviews, including a Consumer’s Digest Best Buy and a 5-star expert review from AllergyBuyersClub.com. The maximum coverage area for this air filtration unit is 1125 square feet, which is far superior to all other models on our list. It has three different filters – a pre-filter, hyper HEPA filter, and a V5 cell gas and odor filter – which can each be replaced separately. The HEPA filtration is certified to filter 99.5% of particles down to .003 microns – the smallest particles that exist. The filter change indicator light will show green, orange, or red to specify filter life left. It has six different speed settings of which only the top 2 would really be considered noisy. One great feature not available on many models is the control settings. You can program the machine to turn on and off at certain times and at specific fan speeds. Despite an annual filter replacement cost of approximately $200, in addition to the asking price, we feel the IQAir New Edition HealthPro Plus is worth the money and we highly recommend it unless you truly need a more affordable air purifier. 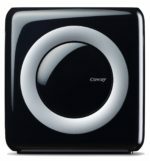 Another strong performer with a much cheaper price tag of $479 is the Oransi OVHM80 V-HEPA Max Air Purifier. The OVHM80 will purify 600 square feet of space by using its four-stage air filtration system to eliminate dust, pollen, smoke, pet dander, mold spores, and odor. Those stages include a washable pre-filter, high-efficiency HEPA filter, activated carbon filter, and ozone-safe ionizer. The three filters should be replaced each year at a cost of about $90. 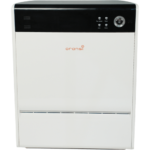 The Oransi OVHM80 is the best air purifier under $500 and when combined with its performance it makes for a great value. It is a great choice for anyone with allergies or those of you looking to elimate smoke and odors. 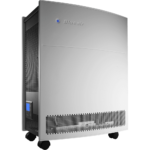 The Blueair 650E is recommended by the leading consumer magazine and will cost about $850. The 650E scored the highest CADR scores possible and is rated for rooms up to 698 square feet all while being extremely quiet in low speed settings. Four speed settings are available with only speeds 3 and 4 being slightly noisy. It comes with a HEPASilent filter which contains a small amount of activated carbon capable of capturing 99.97% of particulates down to 0.1 microns. Users can upgrade to the SmokeStop filter which contains more carbon which is better at reducing smoke, gas, chemicals, and odors. Filters cost between $75 and $150 and Blueair recommends that you replace them every six months. We recommend the Blueair 650E for people who need outstanding air cleaning combined with quiet operation and is an ideal choice for large bedrooms. The original Blueair model, the 503, will cost about $659. It comes highly recommended from the leading consumer magazine and receives extremely positive reviews from most users with a 4.8 out of 5 star rating. The main differences between this and the 650E is the recommended room size of 580 square feet and lack of digital programming controls which means the Blueair 503 is almost $200 cheaper. It uses the same HEPASilent filter as the 650E, while SmokeStop filters are also available. One slight negative is that the seal around the filter is not perfect, so some air can slip passed the filter thus reducing the cleaning efficiency. 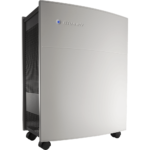 We recommend the Blueair 503 for someone who wants outstanding performance including allergy and asthma sufferers, has a smaller area to purify, and does not need programmable controls. The $215 Honeywell HPA300 was rated as a Best Buy by the leading consumer magazine and scored their highest rating. With a price under $250, the HPA300 might just provide the best value for any air purifier. You won’t find a cheaper model that scores better CADR ratings of 320 for dust, and 300 for smoke and pollen. This air purifier is capable of removing allergens, dust, and odors from rooms up to 465 square feet. It includes 3 HEPA filters plus a carbon pre-filter which all need to be replaced yearly at a cost of about $75. It features electronic controls with a programmable timer and 3 speed settings. At 65 dB on max speed, it is a bit noisy, while even on lower settings it is not totally silent. 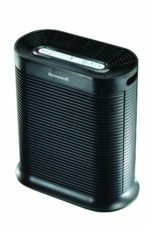 For those of you looking for a cheap air purifier we highly recommend the Honeywell HPA300. There are models that purify slightly better or can handle a larger space, but they cost a lot more; and there are models that are cheaper, but do not perform nearly as well as this unit. It is also available at Sylvane.com. The quietest air purifier on our list with a max noise of 49 dB is the $266 Whirlpool Whispure AP51030K. The leading consumer magazine rated it as a Best Buy with one big factor being the cheaper price tag of under $300 compared to other models that are rated for a coverage area up to 500 square feet. With a certified CADR rate of 315, the Whispure includes a charcoal pre-filter with a HEPA filter which can capture 99.97% of particles down to 0.3 microns. The pre-filter does not have enough carbon to eliminate all odors and needs to replaced every 3 months. The HEPA filter should be replaced once a year and the combined filer replacement costs are about $125 per year. Featuring four speeds, it is one of the quietest units available even on a turbo speed 4 setting. While it does not purify the air quite as well as the top tier models, we recommend the Whirlpool AP51030K for people on a more limited budget who also want a very quiet machine. A newcomer in the air purifier market that has created a lot of buzz and has been picked by some websites as their best air purifier is the $230 Coway AP-1512HH Mighty Air Purifier. It can handle rooms up to 326 square feet with ease with CADR scores of 246 for dust, 233 for smoke, and 240 for pollen. This compact model, just 18.3″ x 16.8″ x 9.6″, features a four-stage filtration system which includes a washable pre-filter, a carbon filter to remove odors, a true HEPA filter, and Vital ION technology ionization system. The HEPA filter lasts up to one year, while the carbon filter lasts up to 6 months and both can be replaced for about $50. Other features include Auto mode, 3 fan speeds, onboard timer, filter replacement indicator, and more. On its lowest speed setting, it is quieter than any other air purifier at just 24.4 dB. While its max dB is 54 on high. Overall the Coway AP-1512HH is ideal for treating asthma, allergies, odor & chemical sensitivity, and removing airborne germs in medium sized rooms. The $195 Winix WAC5500 True HEPA Air Cleaner is our choice for the best air cleaner under $200. 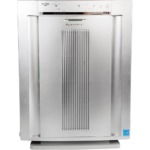 The WAC5500 is capable of cleaning a 350 square foot space with its 3-stage HEPA filtration system. It uses a carbon pre-filter, true HEPA filter, and PlasmaWave technology which is designed to eliminate airborne pathogens. The HEPA filter is washable and can be re-used up to 18 months, while the carbon filter needs to be replaced every 3 months. A year supply of carbon filters costs about $45 while the HEPA filter costs about $75. This Winix air cleaner includes electronic controls with an auto mode, air quality sensor, and 4 fan speeds. However, there is no programmable timer. CADR ratings for the Winix WAC5500 are also a bit lower than higher rated units on this list with scores of 216 for dust, 236 for smoke, and 252 for pollen. 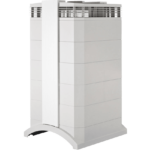 Overall the Winix WAC5500 is a decent air purifier, however, we recommend spending a few more dollars to get either the Honeywell HPA300 or the Coway AP-1512HH if you are looking for a model around $200. Our pick for the best air purifier under $100 is the $96 GermGuardian AC4825. This slim tower is also the best-selling air purifier on Amazon as of this writing with the main weakness being that it only purifies a room 155 square feet or smaller. The AC4825 uses a 3-stage filtration system including an activated charcoal pre-filter, true HEPA filter, and UV-C light to decompose odor molecules and help prevent bacteria and mold growth. Each filter lasts about 6-8 months and cost about $28, while the UV light bulb lasts about 10-12 months and costs about $30. The tower design will save space for some buyers, but it is lacking digital controls like a programmable timer. Also the GermGuardian AC4825 will not work as well as some of the other units on this list in a large room, but for a room of 155 square feet or smaller it will work just fine. The best travel-size air purifier is the $60 GermGuardian AC4100. This small table-top unit is capable of cleaning air in a room up to 120 square feet with its 3-stage filtration system that is just like the AC4825. 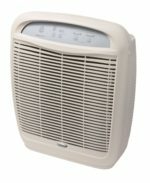 The HEPA filter lasts up to 8 months and has a replacement cost of $22, while the UV light will last up to one year and can be replaced for $15. The GermGuardian AC4100 has a rotary dial with 3 speed settings that are all very quiet. You can place it horizontally or vertically on a tabletop to suit your space. 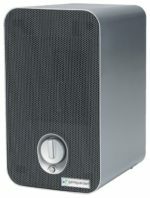 This cheap air purifier will blend into the decor in a small room or office, however it is lacking in overall performance and is especially weak in odor control.